On each episode of Heavyweight, Jonathan Goldstein sets out to undo his guest’s private paranoias. With subjects ranging from his parents to his close friends to total strangers, Goldstein tasks himself with fixing a soured relationship. The show’s goal, to make your psychic pain public and repair a rotten moment from the past, is a lofty one. The fact that Heavyweight succeeds makes Goldstein an unlikely miracle worker. While Heavyweight’s delightful first season dedicated more than half its episodes to people in Goldstein’s own life, season two, which wrapped up in December, takes a broader and more serious approach. Friendship is less the focus than survival. Cancer, foster care, car crashes, and heartbreak all serve as jumping-off points for season two’s episodes. What the show loses in Goldstein’s sitcom banter with his best friends it gains in dramatic stakes. Goldstein has made his job harder, putting himself in situations he has no right to be in, unless it all works out. Goldstein negotiates this newfound emotional distance between him and his guests in the second season using the same trick he did in the first: bad audio. He relies heavily on peripheral noise, and gets to know the strangers who take center stage largely through the minutia that sneaks into his recordings. “Rose,” about a woman who was expelled from her college sorority shortly after receiving the news that she was finally cancer-free kicks off season two. It is Heavyweight’s best work to date, and a quietly showy performance by Goldstein and his production team. Much of the episode is spent sifting through bureaucracy, as Goldstein and Rose spend weeks trying to get answers from the insular sorority’s national headquarters and cold calling Rose’s ex-friends, who are emotionally unavailable and busy with adult lives of their own. Their quest to get answers is consistently stymied by logistics; the sorority sisters are called away from the phone to deal with their jobs or their kids. Then Rose starts to get frustrated. The banality of the episode’s plot, the incredible failure of Goldstein’s journalistic duty to get answers, leaves plenty of time for Goldstein and Rose’s relationship. The first Heavyweight guest to be seriously, rather than jokingly, skeptical of Goldstein’s ability to help, Rose regularly ignores Goldstein’s calls and reacts coldly to Goldstein’s lackluster findings. Halfway through the episode, Goldstein tells Rose to stop chopping potatoes and slamming the fridge while he’s recording. What Rose expresses in her phone etiquette — boredom, distraction, a refusal to cow to Jonathan’s wishes — does more to explain her character, and why such a person may be ousted from an institution that expects conformity, better than any traditional exposition. The vibrancy of “Rose” is achieved through so much absence: missed phone calls, stifled conversations, lost files. Goldstein and his team use the margins of the story to make a nominally boring tale a living thing. Unsatisfying answers are par for the course with Goldstein. 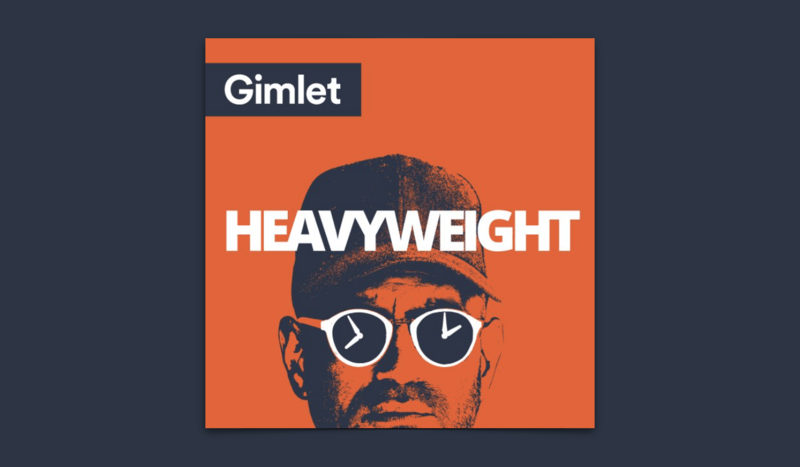 Heavyweight, a terrible mystery show, starts each episode with a question: why was I not allowed to play basketball in high school? What happened to make my mother so anxious all the time? The answer is typically obvious or unattainable. That each episode elbows its way toward a cathartic nadir without revealing much of any new information has to do with Goldstein’s interview style — which is to say he doesn’t really interview his guests. The facts of the case matter much less to Goldstein than questions like, “How many times a week do you work out?” He wants to know about his guest’s smallest memories, because we get the sense that everyone’s grown tired of hearing about his. When Goldstein can’t stir an emotional climax out of his guests, he makes himself the subject. The season’s penultimate episode, “Isabel,” is much more about Goldstein than Isabel. Heavyweight’s host wants to return a suit case’s worth of love letters — a suitcase left on a New York street corner in 1999 and passed on multiple times before finding its way to Goldstein — back to the woman who wrote the letters two decades ago. The twist is that Isabel politely refuses them when Goldstein asks to return the letters. Goldstein dedicates the episode’s third act to reconciling Isabel’s indifference toward the relics of her past and the show’s mission, which is to revisit and redecorate the past with enthusiasm. The Goldstein method isn’t for everyone. The fact that tracking an individual’s anxieties over the course of many years makes for easy listening is the greater shock than Isabel not wanting the letters back. “Isabel” works because of the sincerity of Goldstein’s surprise. How could she not spend her life inside her memories? In Goldstein’s world, a couple oversharing phone calls can solve anything. He’s a phone optimist, like the great comedic filmmaker Nicole Holofcener, whose excellent first feature Walking and Talking from 1996 finds its structure in phone calls. Like Goldstein, she’s fascinated by the business of sustaining relationships over many years, and how we marry our memories with a disparate present. Goldstein may wish that many episodes of Heavyweight took place in the Walking and Talking pre-cell phone era. The film is interested in the way friends talk over the phone, and its major conflict is set-off by the wrong person hearing a message on an answering machine. Goldstein too loves to find narrative shape in the mechanical clunkiness of landlines. He refuses to cut moments of audio when he’s being passed around from family member to family member, when he’s told to hold on a minute while his wanted party comes to the phone. He wants to return to the glory days of cold calls, before caller ID ruined everything. It’s on these calls, when several family members are gathered around the phone, that Goldstein’s microphone picks up the conversational patterns that loved ones fall into. The intimacy is found on the story’s margins, like when his guest Milt tells us not to mind the muffled laughter, that his wife always howls watching John Oliver. There’s comfort for Goldstein in burying himself in the anxieties of others. Heavyweight’s second season features more guessing and fewer answers than its first. But it’s just as engrossed in the rhythms of relationships. Goldstein believes there’s an urgent history to be told of our every routine, in the phone calls, arguments, and jokes we repeat every day. Previous PostWhat is Modern Art, Like, About?